Don’t let missing teeth lower your self esteem. Reach out to my Ashburn dentist for an appointment today. If you’re missing one or more teeth, you may be embarrassed to talk, smile, and laugh around others. At My Ashburn Dentist, we offer comprehensive dental implant solutions for patients of all ages. If you live in the greater Ashburn area and you’re considering permanent tooth replacement, call our team today. Missing one or more teeth is more than just an inconvenience; it’s also a serious health matter. At My Ashburn Dentist, skilled practitioners offer comprehensive dental implant solutions. Patients appreciate the care and concern they receive and love their smile after getting dental implants. If you live in the greater Ashburn, Virginia, area and are looking for a permanent tooth replacement option, call or use the online scheduling tool to book a consultation today. What are the health risks of missing teeth? These scenarios are legitimate problems, but missing teeth can also lead to more severe issues. When you lose one or more teeth, the roots of the surrounding teeth can deteriorate, a process known as bone resorption. Bone loss can weaken the stability of your remaining teeth and can lead to a sunken appearance in the lower half of your face. The process of getting dental implants requires multiple office visits over several months. The initial consultation allows the practitioner to evaluate your teeth and gums to determine the best course of action. If dental implants are viable for you, your dentist makes a small incision in your gums to access a portion of your jawbone. A small pilot hole drilled into the bone allows for proper implant positioning. After your gums heal, you return to the office to have a small collar known as a healing cap put over the end of the implant. Your dentist then places an abutment over the implant, which serves as the connection between the implant and the crown. Crown installation is the final step. There are several placement options for dental implants, depending on how many teeth need replacing. Your dentist determines which type meets your needs, and explains the process in detail. These are individual dental implants that are embedded into your jawbone to support one artificial crown. Ashburn dentists use single implants when there’s just one missing tooth between two healthy teeth. Dental implants can also secure a full set of dentures on the top or bottom jaw. Your jawbone anchors several implants, and those posts connect either a top or bottom set of dentures. Implant-supported dentures are far more stable than traditional dentures. To learn more about dental implant options and find an approach that’s right for you, call My Ashburn Dentist to schedule a consultation or book your appointment online. What Does A Dental Implant Consist Of? The implant itself. A screw will serve as the root of your new teeth, which is what permanently attaches to your jaw. The abutment. This is a connector that can only be removed by your dentist. It supports and holds the new tooth or set of teeth in place. The crown. Also known as the prosthetic tooth, this is the portion of the tooth that you can actually see. It is often made from zirconium or porcelain. The beautiful thing about dental implants is that you can use them to replace a single tooth or multiple teeth. Some people even use them to replace their full upper or lower set of teeth. If you’re thinking about getting dental implants or your dentist or oral surgeon has recommended them, we encourage you to give them a try. There are many advantages to dental implants, and we’ve listed some of our favorites below. Your smile is the first thing people notice about you. Since dental implants look, feel, and function like natural teeth, they can improve your physical appearance and give you more confidence in your smile. You also don’t have to worry about your new teeth falling out as dental implants are a permanent solution that are fused with your jaw bone. If chewing hard foods makes you nervous, you’re not alone. It’s easy to feel self-conscious about your ability to chew, drink, and speak when you have loose or missing teeth. With dental implants from My Ashburn Dentist, you can eat your favorite foods with confidence and ease. Unlike sliding dentures, which can make chewing a troublesome task, dental implants are connected to your jaw bone and are extremely durable. Many people with dentures have a hard time speaking clearly because they can move around in the mouth. This can lead to mumbling or slurring your words, which can be embarrassing. With dental implants, you can speak confidently without worrying that your teeth will fall out of your mouth. Yes! While the success rates of dental implants may vary depending on where the implants are placed, they have a success rate of 98%. People who have received dental implants often say that there is little discomfort associated with the procedure. Oftentimes, your dentist will utilize a local anesthesia to ensure the patient is comfortable throughout the process. If you live near Ashburn and you’re looking for a professional dentistry, be sure to visit My Ashburn Dentist. 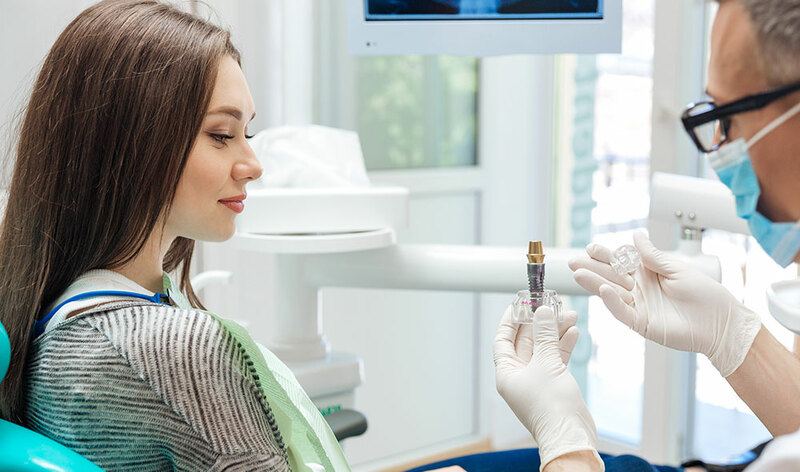 In addition to dental implants, we also specialize in cosmetic dentistry services including teeth whitening, dental veneers, crowns, bridges, dental implants, and more. Our dental office offers state-of-the-art technology, allowing our dentists to perform cutting-edge care to each and every one of our patients. Visit our before and after page to see some of the recent dental work we’ve done, and be sure to check out our promotions page for deals and perks. If you have any questions about our dental solutions, or you’d like to learn more about our dental implants, contact our professional team today.